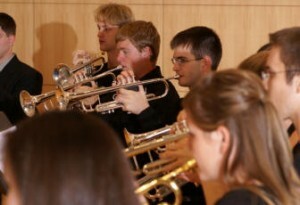 Each basketball pep band – one each for men’s and women’s basketball – has approximately 20 members. Both bands play for 10 home basketball games each year. Auditions are the last week of October. Each member receives a $100 cash stipend at the end of the season. No academic credit is given. The Truman State University “Statesmen” Marching Band is known for its show-stopping music and creative drill design, numbering approximately 150 students each year – including 35 members in the front percussion ensemble and on-field drumline, 15-20 in the flags, and 100 in the horn line. The Statesmen rehearse three times a week for the first 8 weeks of school and perform at all home games. Once a year the band travels out of town to perform in exhibition at high school marching band festivals and on occasion at professional football games. No auditions required. Each first year band member receives a $100 cash stipend; second year members $200; third year $300; and fourth year $400. You also receive 1 hour of academic credit for participation during the fall semester. The Truman State University Drum Line performs as part of the Statesmen Marching Band during the football season. After the season, they continue as a competitive indoor ensemble and often travel to percussion festivals and competitions around the country. They rehearse with the marching band and hold section rehearsals once each week. No auditions required. 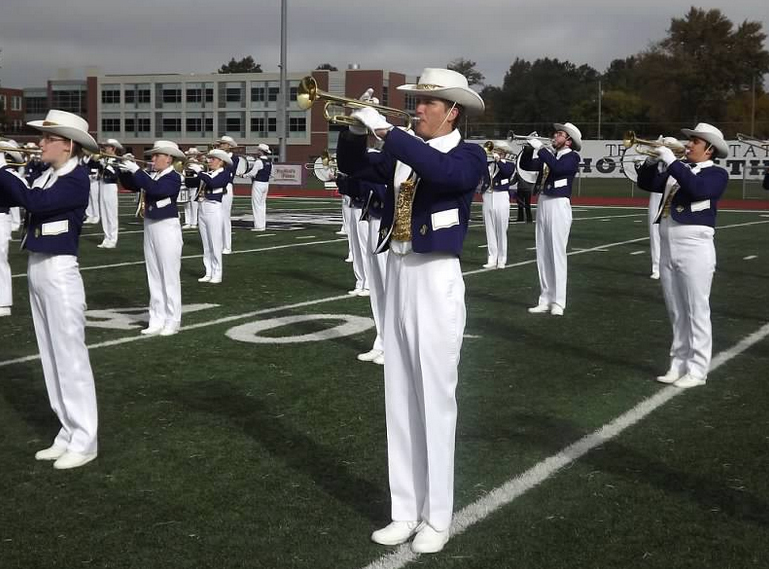 Members receive the same stipend as the marching band and 1 hour of credit for fall semester. For more information, contact Dr. Michael Bump. For over 20 years, this ensemble has been a consistent award winner in indoor competitions held by the Percussive Arts Society, Bands of America, and the Spartan Percussion Festival. At its most recent competition, the ensemble placed 2nd at the 2003 PASIC Marching Percussion Festival, Small Ensemble Division, Louisville, Kentucky. As Truman’s premiere choir, Cantoria has been acknowledged as a model of choral excellence, known for performing a wide range of distinctive choral repertoire. With about 50 singers, Cantoria’s repertoire includes miniature masterpieces from all time periods, significant a cappella compositions, newly composed works, and choral-orchestral masterworks. Recent concerts have focused on music of American composers. Cantoria maintains an active performance schedule on and off campus. Performances at recent MMEA conferences (2017, 2012, 2007) evidence the high expectations of performance and commitment level of the singers. Cantoria tours regionally and internationally, with study abroad programs offered every three years. Contact Dr. Mark Jennings for more details. Visit sing.truman.edu for more information about all of the singing activities at Truman. The singers of Voci are encouraged to think and act within a collaborative model of rehearsal. 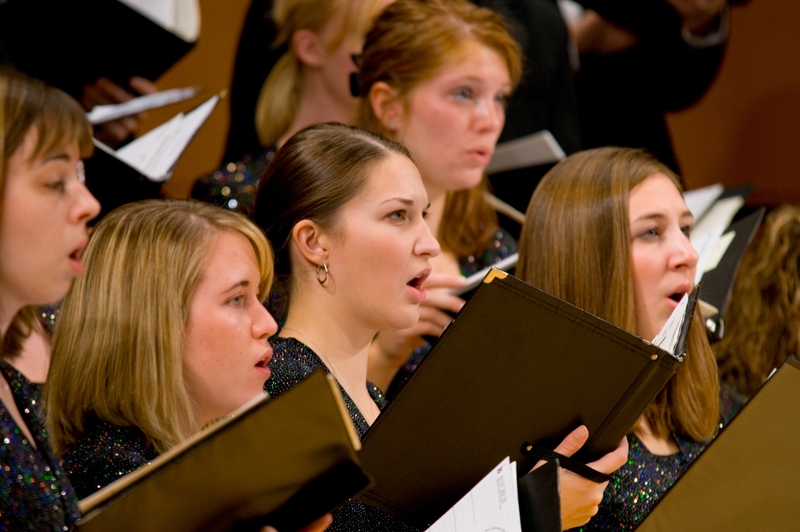 Singers engage the music and texts critically to help define the group’s interpretation of the music and to make connections between the music and everyday life. The singers of Voci take additional ownership of the choir in helping to choose some the semester repertoire and by participating in commissioning projects. 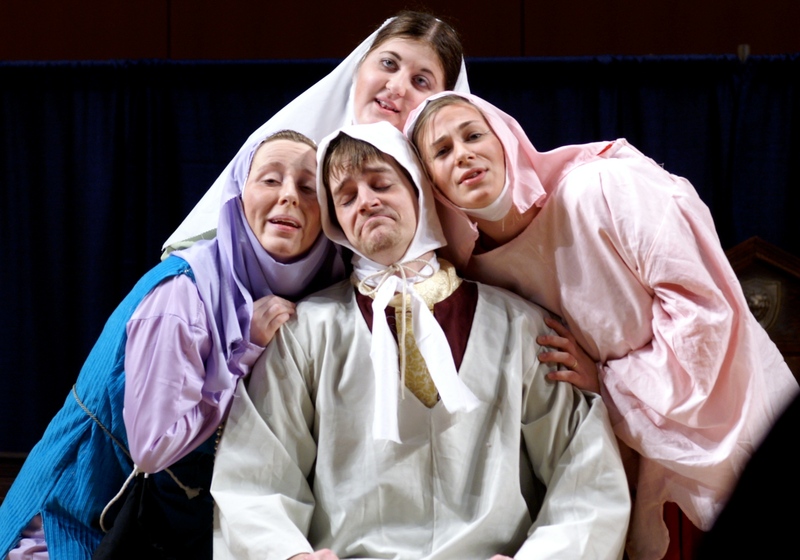 Voci has a history of performing pieces of significance in the women’s chorus repertoire. Contact Dr. Mark Jennings for more details. The Truman State University Opera Program performs two productions each year. 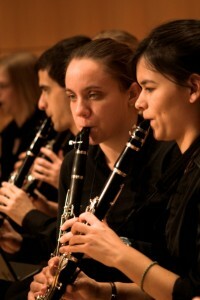 Typically, students perform a scenes program in the fall and a full production with orchestra in the spring. The opera scenes productions contain operatic and musical theatre selections spanning Baroque, Classical, Romantic, and Modern eras. The productions feature student performers, conductors, and orchestra members. Past productions include: Ching’s Speed Dating Tonight!, Mozart’s Impresario, Rogers and Hammerstein’s South Pacific, Menotti’s The Old Maid and the Thief, Donizetti’s Il Campanello, Purcell’s Dido and Aeneas, Strauss’s Die Fledermaus, Mozart’s Così fan tutte, and Puccini’s Gianni Schicchi. Contact Dr. Jeffrey Seppala for more information. Chorus singers meet twice per week on Tuesday and Thursday afternoons at 4:30 p.m., a time when few other courses are scheduled. The choir sings a wide range of repertoire, from traditional folk song arrangements—as in the Fall 2018 program: Songs from Around the World—to choral-orchestral masterworks with Cantoria and the University Orchestra. Choral ensemble experience and/or solid music reading background is highly recommended. 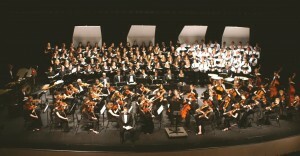 Chorus performs one or two concerts per semester. Contact Dr. Mark Jennings for more details. The Truman State University Brass Choir is made up of 15-18 of Truman’s finest brass performers. The Brass Choir has several performances each year, including performances with the University Chorus on occasion, and has toured throughout the region. All majors are welcome to auditions the first week of classes. Members rehearse twice a week and receive 1 hour of class credit for participation each semester. For more info, contact Dr. Jay Bulen. The Truman Clarinet Choir is comprised of 30 clarinetists playing literature specifically composed for clarinet choir, as well as transcriptions of well-known works by composers like Mozart, Bach, Debussy, and Rimsky-Korsakov. This ensemble has traveled the country for decades to perform – from the 1965 New York World’s Fair and the 1967 Canadian World Exposition in Montreal, to the 2012 & 2016 Missouri Music Educators Association Conferences, the 2012 Buffet/Vandoren Clarinet Ensemble Festival, the 2013 Music Teachers National Association Conference at the Disneyland Resort, the 2016 International Clarinet Association (ClarinetFest) Conference, and the 2017 Missouri Bandmasters Association Summer Convention. The Truman Clarinet Choir has also commissioned and premiered new works, including The Shaman Speaks by Dr. Vivian Fung in 2009 and Rippling by Man-Ching Donald Yu in 2017. The ensemble regularly performs for the community, including concerts at local elementary schools and assisted living centers. All majors are welcome. The ensemble rehearses once a week during clarinet studio class (Wednesdays, 5:30-6:30 p.m.) and performs at least once a semester. To join or schedule a performance, contact Dr. Jesse Krebs. The Truman State University Concert Band is open to anyone who would like to play and is made up of 90-100 campus musicians during the fall semester and 60 during the second semester. All majors are welcome and auditions for chair placement are held each October. 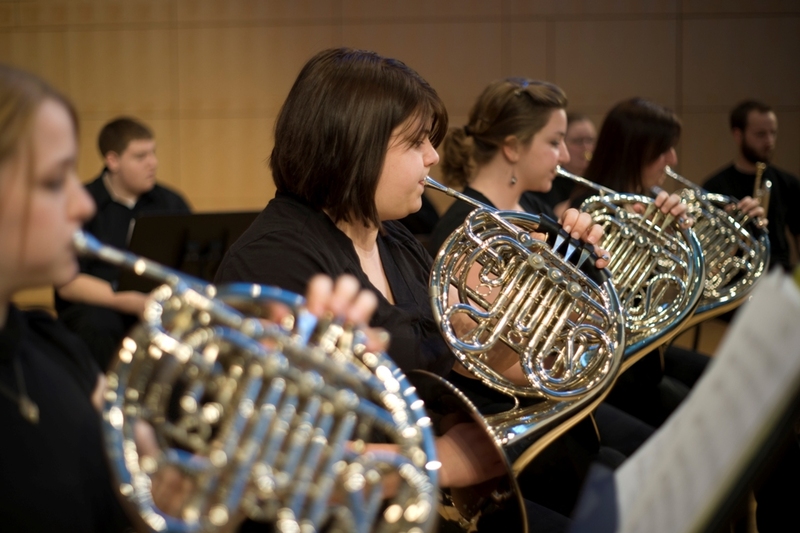 The concert band rehearses twice a week and members receive 1 hour of credit for participation each semester. The Truman Horn Choir is made up of eighteen horn players who rehearse once a week, and perform at least once a semester. The ensemble typically plays a variety of quartets, sextets, and octets, either written or arranged for horn ensemble, including works by Rossini, Mozart, Grainger, and Mendelssohn. 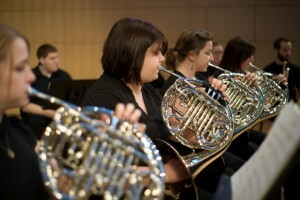 Members of the horn choir have many opportunities to perform in other ensembles within the music department, such as the Wind Symphony, University Orchestra, Brass Choir, Marching Band, and Pep Band. All majors are welcome. For more info, contact Patricia Mickey. 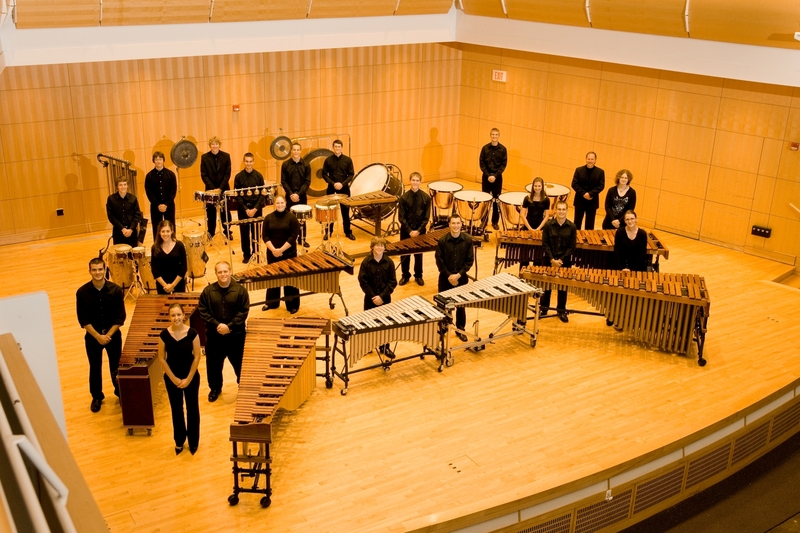 Recognized in the Midwest for its outstanding performances of standard, world-ethnic, and experimental percussion music, the Percussion Ensemble performs regularly with international guest artists hosted by the percussion studio. It has twice been the featured percussion ensemble at the Missouri Music Educators Association (MMEA) annual conference, as well as at the Percussive Arts Society International Convention with guest Mexican marimba artist, Steven Chavez. The ensemble has been involved in the commissioning and premiere performances of new works by Jared Spears (Legacy), James Romig (The Frame Problem), and Raymond Helble. The percussion program at Truman, including the Concert Percussion Ensembles and the Indoor Marching Percussion Ensemble, are endorsers of and sponsored by Sabian Ltd., Innovative Percussion, Inc., and the Pearl Corporation. For more info, contact Dr. Michael Bump. The President’s String Quartet is an honors ensemble that performs frequently at University functions and chamber recitals, competes at regional and national conventions, and coaches extensively with the strings faculty. Auditions are in March for the following academic year. Members receive a stipend of $1800 per school year in addition to an orchestra scholarship. You are also required to maintain enrollment in private lessons, the Truman State University Symphony and Chamber Orchestras. For more information, contact Dr. Brian Kubin. The Truman State University Symphony Orchestra comprises 80 student musicians performing 6-7 times annually on campus and touring the region each fall semester. The orchestra also performs on New Music Festival concerts with Truman choral ensembles in major works for chorus and orchestra and accompanies student soloists on the annual Gold Medal Concert. The Missouri Music Educators Association has three times invited the group as its featured orchestra convention in Osage Beach. Members also tour internationally every other May to such places as Italy, France, Austria and the Czech Republic. For more information, contact Dr. Sam McClure. The Truman Trumpet Ensemble is a premiere performing group that premieres new works by contemporary composers and allows trumpet students to play individualized parts in a variety of styles. The ensemble has appeared twice on the International Trumpet Guild Conference and at the Florida Trumpet Festival on the campus of Florida State University. Rehearsals out of the weekly trumpet solo class that also includes seminars on performance anxiety, trumpet techniques, musical expression, and many chances to play for each other. For more information, contact Dr. Eric Dickson. 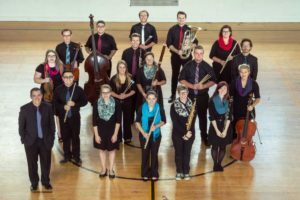 Uncommon Practice, Truman State University’s Contemporary Music Ensemble, strives to cultivate appreciation for modern music amongst students and audiences. The ensemble members develop skills relevant for professional musicians through critical thinking in the music-making process, while being part of an organization that allows for valuable collaborative experiences between students and faculty. In addition to contributing musical talent, all performers contribute to our ensemble by fulfilling the behind-the-scenes roles of performing music. No audition, but instructor approval required for registration. For more information, contact Dr. Victor E. Marquez-Barrios. Truman’s premiere band spends most of its year as two 45 member ensembles (Wind Symphony I & II) and is often divided into chamber ensemble groups. The Truman Wind Symphony has gained national recognition through its six performances on the national stage since 1981, and eight performances at the Missouri Music Educators Association (MMEA) Conference. The ensemble also tours throughout the Midwest on an annual basis. Rehearsals are held every day and members receive 1 hour of credit for participation each semester. 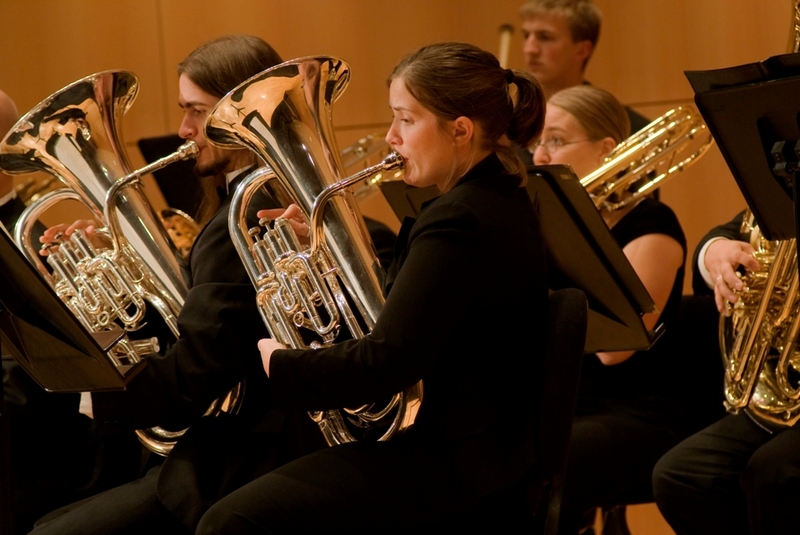 Blind auditions for Wind Symphony take place on the first two days of classes each semester. If you have questions, please contact Dr. Curran Prendergast. The combo experience offers jazz students a chance to further sharpen their improvisation and performance skills. 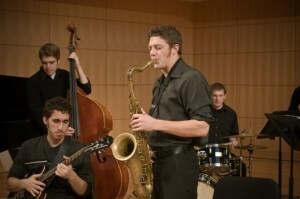 Combos are normally made up of 4 to 7 members and perform throughout each school year. For more information, contact Prof. Tim Aubuchon. This 16- to 18-piece group performs numerous concerts on and off campus and has been featured with such jazz luminaries as Clark Terry, Slide Hampton, Jon Faddis, Bill Watrous, Randy Brecker, John Abercrombie, Matt Wilson, Ben Allison, Ingrid Jensen, and many others. In addition, the group tours both nationally and internationally. Also a 16- to 18-piece big band, the Lab Band provides its members many performance opportunities throughout the school year and is spotlighted with each of the guest artists featured on campus.